The Range Rover - a car worthy of delivering you to a red carpet event, but one dependable warrior that is equally at home in the wild. Now that, to me, is versatility. Not many time pieces can be as versatile as the four-wheeled example I quoted. Most are either too sporty (or casual), or ultra-dressy. However, I've recently found another object that's synonymous with the Range Rover, I mean, versatility - the Dievas Vortex. It is one watch in my stable that I am able to slap on my wrist regardless of the occasion. The Vortex is a simple 3-hand watch, with a simple, uncluttered dial layout. Under the dial is the widely used ETA 2824-2 workhorse. All these are encased in a industrial grey 44mm titanium case. The screw down crown situated at the 8 o'clock position while the HEV is located at the 10 o'clock position. the crown is flanked by relatively thick shoulders. This is also my biggest gripe. Although the crown size is relatively easy to operate, it is rather difficult to screw back down. It can be tough to align the threads. The position of the crown and the crown guards could also be possible factors. The ridged 60-click uni-directional bezel is easy to use and ratchets with solid clicks. The straps are secured to the steeply angled lugs by screw-in bars. The thick lugs add to it's industrially handsome appeal but not overly so that it is not limited to being just a tool watch. Well, aesthetically, at least. The case back is titanium as well and is delightfully spartan. The turquoise lume is another delightful touch to a plain, yet handsome watch. Despite the 44mm case diameter, it wraps around my wrist rather neatly. This, I believe, is due to the steeply angled lugs. The left-hand crown is another added plus as it doesn't dig into the fleshy back of my hand. As I mentioned earlier, this is one versatile little catch. Although it may look casual with the brown strap set-up, it actually looks pretty professional when I'm in my 9-5 office guise. Needless to say, when I'm dressed for the weekends, this little number is equally at ease. It's non-nonsense, spartan, yet modern aesthetics is a major draw for me. 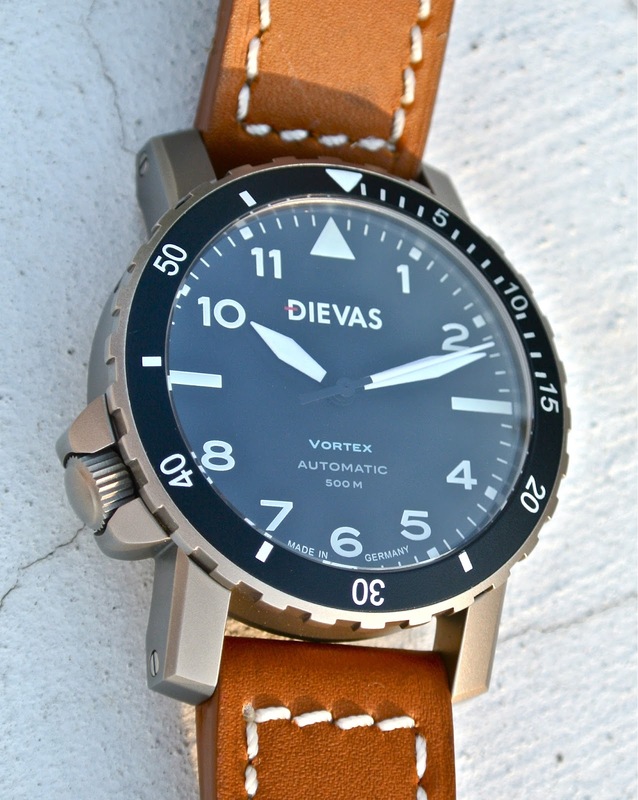 The Vortex comes in two variants - black leather straps with white stitch or a pair of case-fitting rubber straps. The latter could be a problem for smaller wrists as there might be a void between the lugs and the wrist. I've opted for a pair of brown water-resistant straps with white stitch. Case Material : Micro blasted aerospace grade titanium. - Versatility. A watch for all occasions. - Solid build and finish. - VFM - not too costly. - Difficult to operate crown. - Rubber strap might not be suitable for smaller wrists. great review, i got the it too..serial number 490!